Head Coaches for Cross Country and Soccer of Steinbrenner High School nominated their team captains to be recognized by Florida Orthopaedic Institute’s (FOI) Athlete of the Week program for demonstrating outstanding leadership and team playing qualities on and off the field. 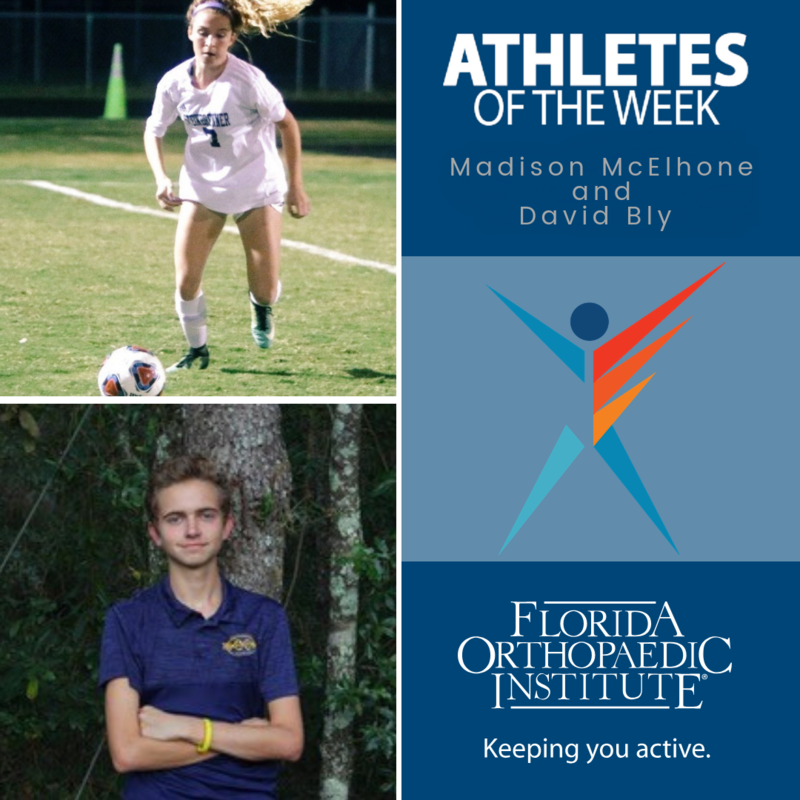 FOI is proud to announce that Davis Bly and Madison McElhone have won the Athlete of the Week award for the week ending November 16, 2018. Bly is a senior cross-country athlete whose athletic goal this year is to capture the State Cross Country Championship as a team. Personally, he aspires to improve his time. Allison Ennis-Szponar, Head Coach for the Boy’s Cross-Country Team had high praises for Bly. “Davis, a senior captain is typically our top runner on the team. At the County meet, he was passed by a couple of teammates. After the race, he was more excited for his teammates who broke their personal records and the fact that his team won the championship, where most would be saddened over their own struggle. Davis boasts a 5.8 GPA, as well as logging over 100 community service hours running with dogs from the Humane Society. He is a member of National Beta Club and National Honor Society,” Ennis-Szponar said. “Throughout my running career, I’ve learned to enjoy working hard to accomplish my goals. My advice would be to always strive to be the best, and don’t be afraid to challenge yourself. Value teamwork and enjoy the journey,” Bly said. McElhone is a senior soccer player whose athletic and personal goals this year are to lead her team through Districts and on to a successful State-run, as she works toward an individual college soccer opportunity. Shannon Scott, Head Coach for the Women’s Soccer Team recognized her hard work and great attitude. “Madison is an extremely hardworking athlete. She is a four-year starter for the Warriors and a senior captain. When she’s on the field, there’s nobody that will outwork her. When she is on the bench, she’s the first person to support the girls on the field. She is an all-around athlete from the classroom to the field. Madison is a very humble yet hungry athlete who is always looking to better herself and the team,” Scott mentioned.